These six ornaments are the first ones of a set of four matching ornament groups. This set features a Santa, candy ornaments, a stocking and a Christmas tree. 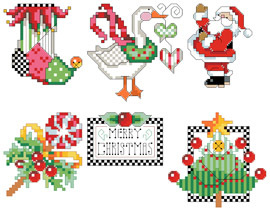 Each ornament in the series features a checkered border or motif. Collect all four! Contents: Each ornament approximently 35 stitches wide by 35 stitches high. If stitched in 14 count they would messure 2.5" wide by 2.5" high.